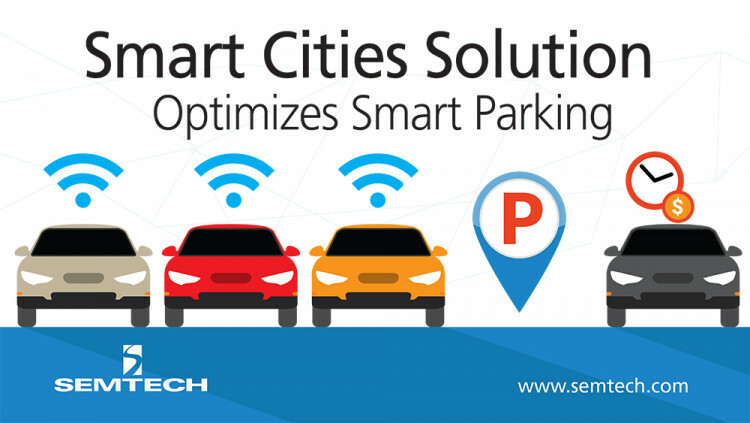 Semtech Corporation (Nasdaq: SMTC), a leading supplier of high performance analog and mixed-signal semiconductors and advanced algorithms, announced that CivicSmart, a provider of parking solutions for smart cities, has integrated Semtech’s LoRa® devices and wireless RF technology (LoRa Technology) in its smart parking solutions to improve city-wide efficiencies and increase revenue for smart cities. LoRa-based sensors combined with credit-card enabled parking meters provide municipalities with a complete solution for expanding the payer base of their parking system. Enforcement officers are able to immediately see with a mobile device which parking spaces are currently occupied or unpaid. LoRa Technology, with its long-range, low-power and low cost capabilities, delivers IoT applications that are optimized for smart city applications that rely on battery-powered sensors. • Long Range: A single base station using LoRa Technology enables deep penetration capability for dense urban environments and indoor coverage, while also providing the ability to connect to sensors more than 15-30 miles away in rural areas. • Low Power: The LoRaWAN protocol was developed specifically for low power and enables unprecedented battery lifetime of up to 20 years depending on the application. • Geolocation: Enables tracking applications without GPS or additional power consumption. • Low Cost: LoRa Technology reduces up front infrastructure investments and operating costs, as well as end-node sensor costs. • Open Standard: LoRaWAN, a Low-Power Wide Area Networks (LPWAN) specification, ensures interoperability among applications, IoT solution providers and telecom operators to speed adoption and deployment. • Learn how LoRa enables IoT, visit Semtech’s LoRa site. • Engage with the LoRa Community to access free training and an online industry catalog showcasing next-generation products you need for building your ideal IoT application. CivicSmart is a smart parking meter designer and manufacturer. The company offers a complete end-to-end smart parking solution, including in-space sensors, smart parking meters and Cloud-based software to manage and track the system. CivicSmart is headquartered in Milwaukee, WI and for more information, visit www.civicsmart.com. All statements contained herein that are not statements of historical fact, including statements that use the words “to improve,” “for expanding,” “designed to,” or other similar words or expressions, that describe Semtech Corporation’s or its management’s future plans, objectives or goals are “forward-looking statements” and are made pursuant to the Safe-Harbor provisions of the Private Securities Litigation Reform Act of 1995, as amended. Such forward-looking statements involve known and unknown risks, uncertainties and other factors that could cause the actual results of Semtech Corporation to be materially different from the historical results and/or from any future results or outcomes expressed or implied by such forward-looking statements. Such factors are further addressed in Semtech Corporation’s annual and quarterly reports, and in other documents or reports, filed with the Securities and Exchange Commission (www.sec.gov) including, without limitation, information under the captions “Management’s Discussion and Analysis of Financial Condition and Results of Operations” and “Risk Factors.” Semtech Corporation assumes no obligation to update any forward-looking statements in order to reflect events or circumstances that may arise after the date of this release, except as required by law. Semtech, the Semtech logo, and LoRa are registered trademarks or service marks, and LoRaWAN is a trademark or service mark, of Semtech Corporation or its affiliates.